With 100+ temperatures running rampant in Southern California, the day I dreaded had finally come – the day I HAD to tackle the Inland Empire stores in Region 1. 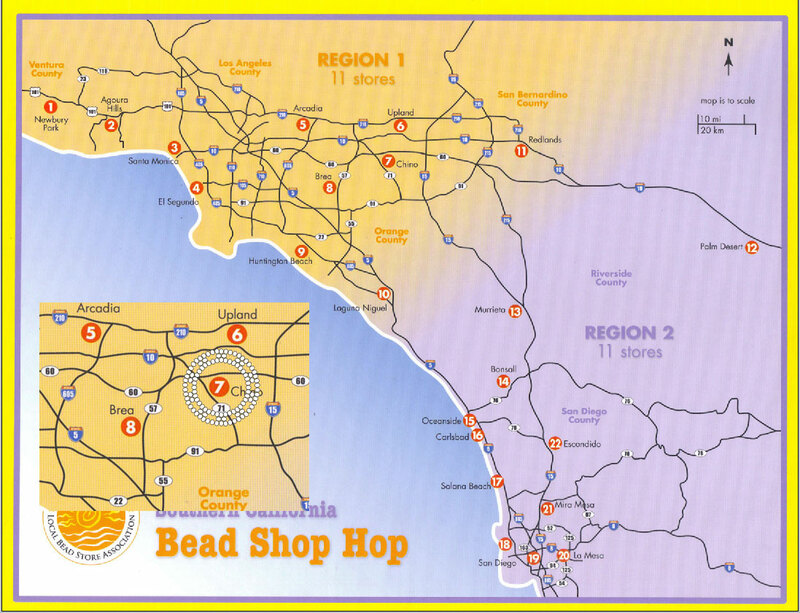 If you glance at the map above, you can see what I mean when you look at stores #6 & #7. They creep Eastward, towards the desert. And when I say desert, I mean DESERT. See that little lone #12 store out in Palm DESERT? The place of nearly eternal 100+ temps? Yeah, that’s the direction. I was headed towards HELL with a water bottle in one hand and my Shop Hop map in the other. Store #6 (or #7 on the map), has the monopoly on the cute little town of Chino off the 60 and 71 out near Pomona. I had zoomed past this area a dozen times on the way to my favorite dried herb and pagan-friendly store Dragonmarsh, but had never venture into this area. 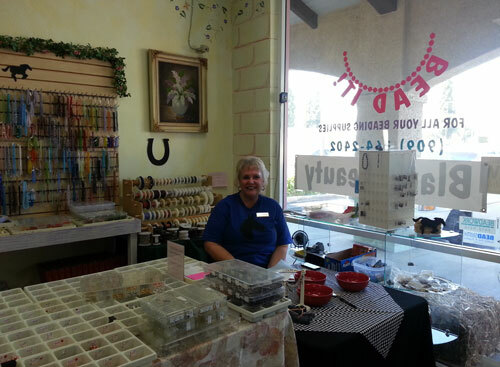 I like the small town vibe and the very friendly local beadwhores (like me) who were gathered inside at the make-and-take table, beading, chatting, eating pizza. I would fit in here perfectly and would be there every Saturday night if it weren’t an 80 mile drive there from Chatsworth. This store takes the prize for best themed mascot. I could literally say I drove 80 miles into the deserts of California to see a ladybug because the ADORABLE little black pony just outside the front door in the parking lot was named Ladybug. Inside were horseshoes on the walls and store mavens with black horse t-shirts – they were all over this theme like flies around, well, a horse. But Ladybug, to her handler’s credit, had no flies and was being pampered under her own tent with lots of water on her back and much love from everyone store hopping. 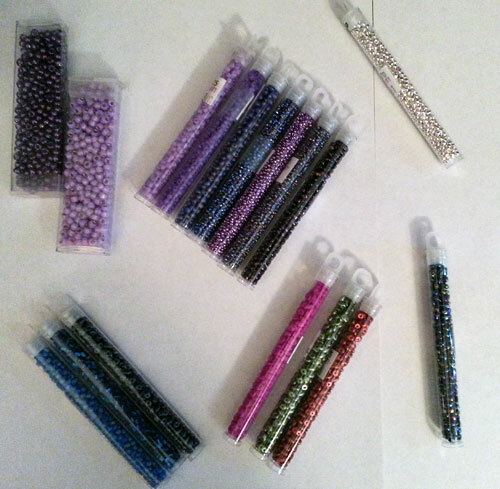 The wall of seed bead tubes is very reasonably priced – so much so that I again lost my mind (I do that a lot in bead stores) and bought wayyyyy too many vials. The czech pearls also got me, but I stocked up on something I had been eyeing at every store so far and kept in the back of my mind – tools! Tools I need and tools to craft jewelry a little more expertly than what I’ve been doing in the past. Yes, it is time to step up my game! 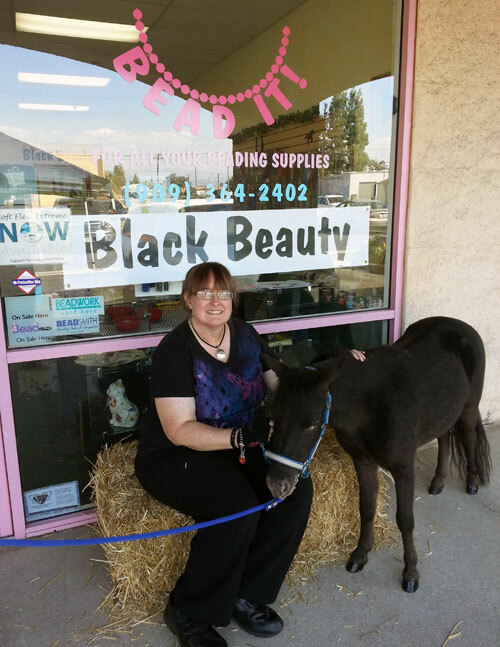 Theme – the book “Black Beauty”, hence everything horse. 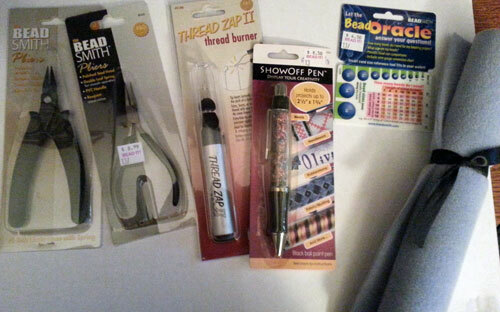 Goodies – a choice of beads or tools – I took a triangular bead scoop – been wanting that for a LONG TIME. A 20% off coupon good in October, a fuzzy mat to keep beads from escaping onto the floor and a strand of free czech pearl-like beads. Left to right – chain nose pliers, round nose pliers, Thread Burner, ShowOff Pen, Bead size and quantity wallet reference card, containment “fuzzy” pad for those runaway seed beads. Left to right – Burgundy Czech Glass Pearls, Dark Blue Czech Glass Pearls, 2-holed Czech Glass “Brick” beads in Iris Blue and Matt Iris Blue. The rest – thank you for visiting goodies – charm, bead scoop, textured pearl beads. 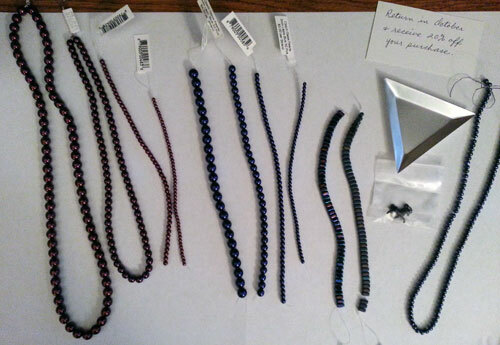 Top – Left to right – Size 8 seed beads, a whole slew of seed beads in various shades of purple…8’s, 11’s and teardrop shaped, silver beads. Bottom – Left to right – more 8’s in beautiful blues, super duos, small dagger beads. None of these had color names, just numbers. They also included FULL SIZED water bottles in the thank you bags. No, THANK YOU! Just what the travelling bead whore ordered. Since I only tackled THREE stores this weekend, I will intersperse the posts with plans for all this treasure. Stay tuned for tomorrow as I reorganize my workspace and introduce the new beads to the old residents. Will they get along? Who the hell knows!!! Pony and pizza? How cool is that? Better watch it, though. Your beads are starting to infringe on my Lego space.